This is part 1 of a 6 part article series focusing on the complete 100% detail disassembly of the Springfield Armory XDS pistol. If you cannot easily find the other sections use our search icon on the top right of the website. Type in "XDS Detail Disassembly" and we will provide you with the complete series. The magazine of the Springfield Armory XDS can be assembled incorrectly. It is important to make sure the orientation of your magazine spring is correct when you reassemble it. The Floor plate must be assembled in the correct orientation or the base will not lock into place allowing the magazine to fall apart. Use a punch and push up on the floor plate (left red arrow & circle shape). This will unlock the magazine base and allow you to push the base towards the front of the magazine body (right image). Use caution as the magazine spring is under pressure. 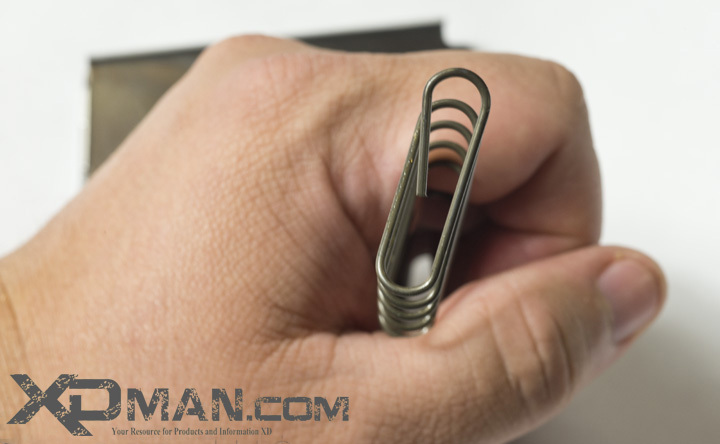 Use your hands to cup the bottom of the magazine so the spring and floor plate will not go flying and get lost or injure someone. The XDS magazine is fully disassembled and ready for cleaning and inspection. Take note of the floor plate, the infinity/figure 8/peanut shape faces up when reassembled. Left to right: You can identify the top of the XDS magazine spring by the top coil & how it bends in on it self. The bottom of the spring does not bend in on it self. The top end with the bent coil is inserted into the follower of the magazine. The bottom non bent first coil is placed over the figure 8 portion of the magazine floor plate.